An AusAPT membership instantly opens the doors to the exciting and expanding field of personality types and a global network of passionate people interested in diverse applications of Type. 2014 is BAPT’s 25th Anniversary, and we have massively enjoyed our 25th Anniversary International Conference. 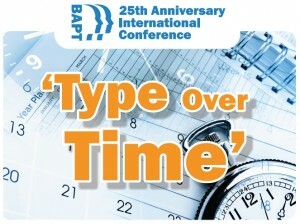 Many internationally-known experts in Type came to present topics related to Type Over Time. We’ve left the Programme available so you can see what went on. The British Association for Psychological Type(BAPT) is a non-profit body of individuals interested in broadening and deepening their understanding of people through the lens of Psychological Type and related concepts. We network to exchange ideas, discuss applications and enjoy talking Type. Additionally BAPT aims to promote best practice and ethical standards in the use of the Myers-Briggs Type Indicator® and other Type related instruments. We provide access to workshops, conferences, Type publications and networking events all aimed at enhancing the expertise of Type practitioners.